One of the best things about living in town is our close proximity to neighborhood bars. While Henry’s is our official home-away-from-home and has been for 11 years, with it’s recent menu hike ($10 for a burger, really? ), we’ve decided to scope out some new digs. JK’s ranks up there for food and ambiance, though it can be pricey too, and sometimes the noise level in the place is a bit much to tolerate, especially on a Friday evening when the place is jam packed. So, we still haven’t found that new home-away-from-home. Henry’s is a tough act to follow. 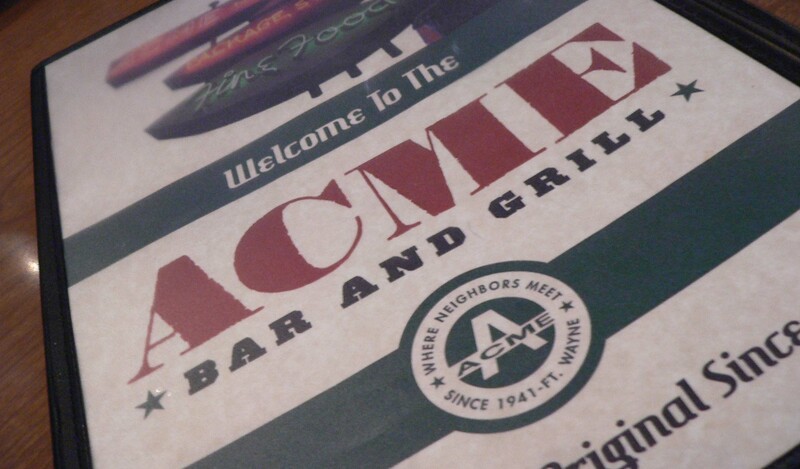 But we keep trying, so today, Jon and I ventured out for lunch at the Acme, a bar that truly resides in our neighborhood. We tried it a few months ago after it reopened and were terribly disappointed. Despite its spiffied up decor, the menu was weak and the service was terrible… I mean terrible. We waited close to an hour for our food, the waitress was unapologetic, the food was sub-par at best, and we waited an excruciatingly long time for our check when we were ready to go. It’s like they didn’t even want our money. For the first time in our lives, we contemplated dining and dashing. The entire experience was a disaster, and it wasn’t even busy. We tried to chalk it up to new management bugs, but we haven’t been back since… until today. I was pleasantly surprised to see a new menu that extended beyond the typical bar fare, and the items seemed fairly priced. Unfortunately, as slow as they were, it took several minutes before anyone acknowledged our existence… and it was all down hill from there. The service was anything but prompt, and we never did get refills on our drinks. I ordered the barbecue beef brisket and Jon ordered the chicken nachos, which were on special. 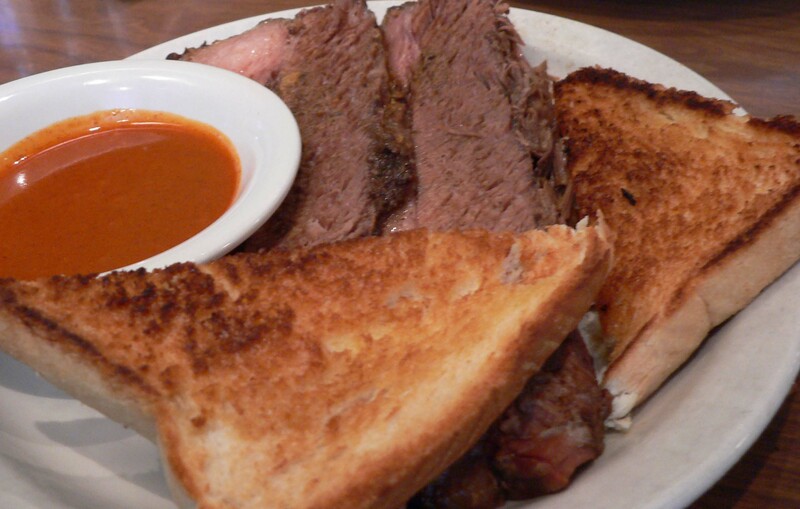 The brisket was pretty good, especially the barbecue sauce, which was spiced up with Louisiana hot sauce, though the menu said it would be served with a toasted kaiser roll. It wasn’t. Instead it came with two pieces of dry toast. Jon’s nachos were anything but impressive. Stale brown chips, covered with chicken, cheese, shredded lettuce and tomatoes. To top it off, they brought him the wrong nachos and they had to be returned. It didn’t take us long to realize that the Acme would not be our new home-away-from home. While affordable, the saying is true: you get what you pay for. I am not saying we won’t go back. Jon wants to try German Night. I hope it’s good. I am not crossing my fingers. Sorry, Acme. We want to love you, but you have some work to do. It took us a few times, but actually it’s become a go-to place for us. The service, well, I don’t think that’s going to change unfortunately, but there are several things on the menu that are terrific! Try the pizza, any pizza. We are fans of thin crust and as connoisseurs of the pie I have to say this is probably one of the best in town!! It’s not perfect, but it is good priced and we always see a friend or two. Let’s keep our fingers crossed it hangs in there and only gets better! So many people have told me they really love it, so we will give it one more try. We tend to be pizza snobs too and have not tried theirs, so that might be next on the list. It’s hard to get a good thin crust in town. Short, sweet, to the point, FREE-exactly as ifnromaiotn should be!